Since it's summer, we're eating most of our meals at the house, which in turn means we have a ton of leftovers. Of course, it's rare that the leftovers have enough to make another dinner out of it, so I've been trying to repurpose them into lunches instead. This lunch contains leftover taco meat and cheese, stuffed into half a pita, to make pita tacos (also much easier for small hands than taco shells, the filling stays in better). There's leftover pesto pasta in the green silicone cup that makes for a lovely cold pasta salad. Non-leftover items include carrots, grapes and strawberries. Now the upper corner? That would be part of my cake ball obsession. I'm slightly addicted to kitchen gadgets anyhow, and my mom got me a cake ball maker last Christmas. They are perfect little cake balls, every single time! These ones are vanilla, with just the top dipped in white and milk chocolates, with sprinkles. 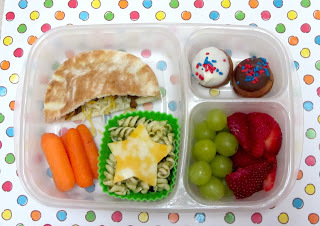 Lunch is packed in our Easy Lunchboxes (also available on Amazon).